December 2, 2018 By Bob Pilgrim & filed under All Articles, Essentials, Gear. 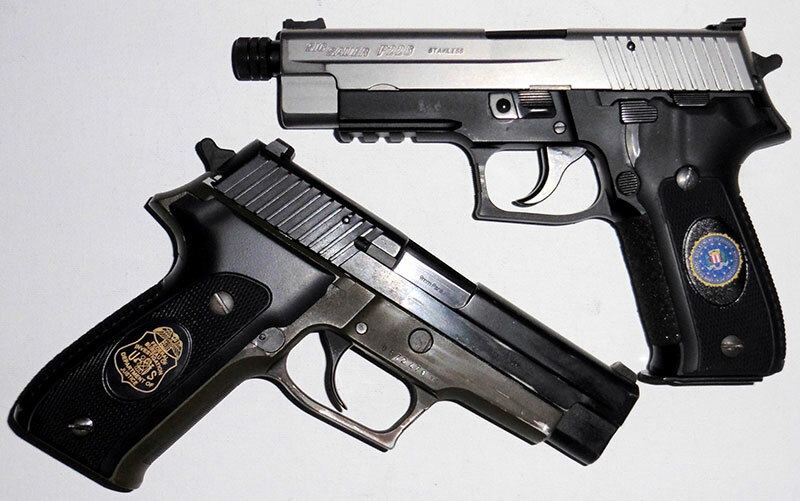 Brace of SIG Sauer P226s with grips emblazoned with FBI shield (top) and FBI agent’s badge. Shield is UV printer colorized image. Badge is CO2 laser etched. Most of us carry black guns, because they look like real guns, not toys. Stainless steel is a close second, due to its rust resistance, durability, and attractiveness. Flat Dark Earth (FDE) is gaining popularity as a result of the desert warfare in Iraq and Afghanistan. Most guns remain stock as they come from the factory, although some may need better sights and a trigger job. Many gunmen prefer to carry a factory spec’d weapon and consider modified guns a problem waiting to happen. Still, a fair number of gun owners want to personalize and upgrade their firearms with various embellishments. Extensive engraving is favored by some, but many of these guns become display or safe queens. 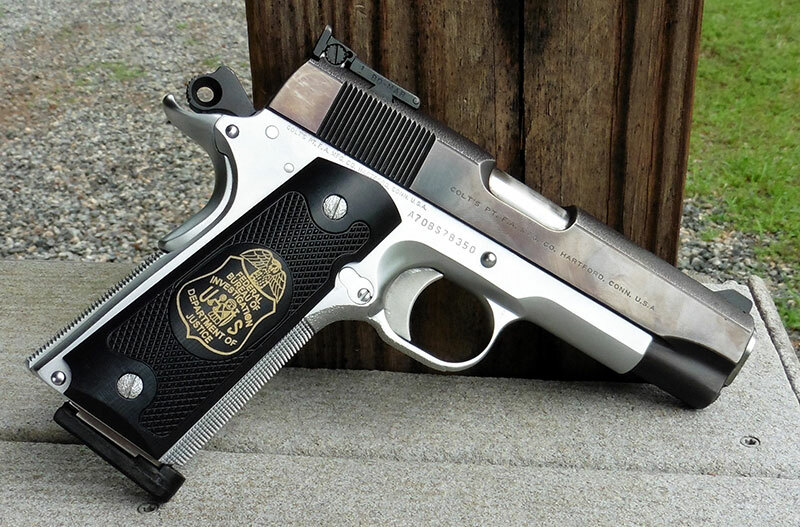 Roland UV printed FBI badge on author’s Novak Colt Commander. I appreciate guns as art as much as anyone, but concealed-carry practitioners should realize that a shooting—even if justified—will result in your firearm being seized as evidence, indelibly marked in some manner to establish chain of custody, and stored in an evidence locker for months to years. Prosecutors and defense attorneys will have access to the firearm and its treatment may be lacking. Nevertheless, professional gunmen who frequently rely on a particular firearm to conduct business or hunters who use it to fill their larders may want to personalize their “Lucky Gun,” which is what legendary Oklahoma City PD and FBI gunfighter Jelly Bryce called his S&W .44 Special. Jelly’s S&W revolver was not modestly modified. Perhaps to further intimidate the subject staring at its yawning muzzle or to prevent rust, it was nickel plated, nicely engraved, and had ivory stocks. The right panel had an engraved steer head and the left featured a black cat and the number 13, which he swore brought bad luck to the criminals he confronted. A bit extravagant for my taste in a carry gun, but I would never risk criticizing Jelly, especially if I’d been fortunate enough to be one of his students at the FBI Academy in the 1930s. It’s hard to argue with success, and he was a Hoover favorite. As this set of 1911 grip panels shows, detail is outstanding. My idea of enhancing my car gun, a 20-round DA/SA SIG Sauer P226 9mm pistol, was to combine practicality with a nod to art in the form of the FBI special agent’s gold badge and the FBI shield laser imaged on a set of black aluminum grips for the full-sized piece. Conrad Berry of Gun Grips advised that the precision CnC machined and anodized grips were originally offered by Hogue, but he purchased their entire stock when Hogue decided to discontinue the line. 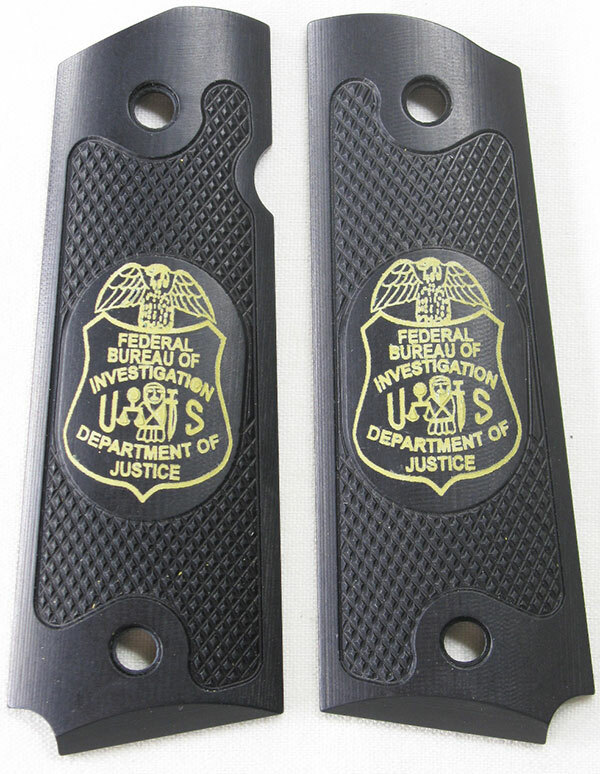 These grips feature Hogue’s standard checkering but with an additional smooth oval pad to add etched and printed images. Gun Grips uses a CO2 laser to create their collection of mono-color images or custom images, and a Roland UV printer to colorize the same. Order completion takes about seven to ten days. All Gun Grips requires for custom work is a quality image. Before delivery, they send the customer a photograph of the image on the grips to determine if it is what the customer had in mind. Gun Grips can add a custom touch to either a carry piece or a pistol that has been retired after years of faithful service.